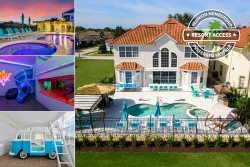 This 3-floor luxury home in Reunion Resort has all the amenities your family needs for a truly amazing vacation. This beautiful home boasts a rare combination of characteristics including privacy, luxury living, and family entertainment! This villa offers 6 bedrooms, 4 baths, a theater room, games room, private courtyard pool and an outdoor built-in gas BBQ. As you step inside, you will be greeted by a luxurious living room, kitchen, and dining area. The living room will make you feel right at home with comfortable seating surrounding the 70-Inch HD SMART TV. Head over to the fully equipped kitchen offering all the stainless steel appliances including a Keurig and traditional coffee maker, blender, toaster and more! Your family will have everything they need to whip up an amazing meal. Sit down and enjoy a formal meal around the dining table or grab a quick bite at the breakfast bar. Downstairs you will find the first Master Suite featuring a king bed, 50-Inch TV with an Apple TV 2, luxurious furniture package, French style doors leading out to the courtyard, and en-suite bathroom. The private bath offers jetted tub, a walk-in shower and plenty of counter space with his and hers sink. The second floor features three bedrooms including two rooms for the kids! Imagine your child's reaction as they step inside their very own their own room featuring a 42-Inch SMART TV and a full over full bunk bed. The second kids' room offers a 42-Inch TV and a twin over twin bunk bed. There is also a twin rollaway bed within the home for those little ones that may not be old enough for the top bunk - no attention to detail has been missed. The second upstairs master bedroom boasts a 60-Inch Smart TV and balcony access overlooking the golf course as well as an en-suite bathroom also with his and hers sink, and plenty of walk-in closet space. Feel like watching a movie during your vacation? Pop some popcorn and head up to the third-floor movie room with 3D movie projector, SMART DVD/Blu-ray player and an Apple TV 2 to keep everyone entertained all on a 14 ft. screen and comfortable seating. Also, on the 3rd floor, you will find a large balcony with outside bar and seating for 8 - perfect to take in the breathtaking elevated views. After the movie, let the games begin in the games room! The family can choose from slate pool table pool, arcade dart board, air hockey foosball or from a variety of arcade games including a Video Arcade system with over 120 games including Golden Tee, a Marvel arcade system, and a Need for Speed Underground Driving Simulator arcade game. There is also a 70-Inch SMART TV and a Sony PS4. You will want to spend plenty of time in your private courtyard pool to enjoy the Florida Sun in privacy. Relax in the large spa or in one of the 4 sun loungers. There is also outside seating that offers a gas fire pit for the evenings and a built-in gas BBQ. Across the courtyard, is the Annex offering more privacy and space for your guests in your party. Not only are there two additional bedrooms but also a kitchenette and cozy dining area. The two additional bedrooms feature a comfortable King with a 50-Inch TV with Apple TV 2 and the second offers a 32-Inch Smart TV and a Queen sized bed. This home also boasts child-friendly features as pool fence (easily removable) with an upgraded self-closing door for convenience and peace of mind. Inside you will find built-in stairs gate on the 1st and second floor, full-size crib, pack n play, high chair and a stroller all within the home to make your life just that little easier while on vacation. Want to put yourself in vacation mode? Then control the wall mounted iPad to choose your favorite music station and select which Sonos speaker located inside and outside you would like to play for you. All of this and more is located in the world-class Reunion Resort, located only 6 miles to Disney! With luxurious amenities including 6 onsite restaurants, 8 community pools, fitness center, a day spa and children's activities, your family will have everything they need for a full getaway. Book this magical vacation home today to turn your vacation dreams into reality! Please note - Construction is taking place near this home.